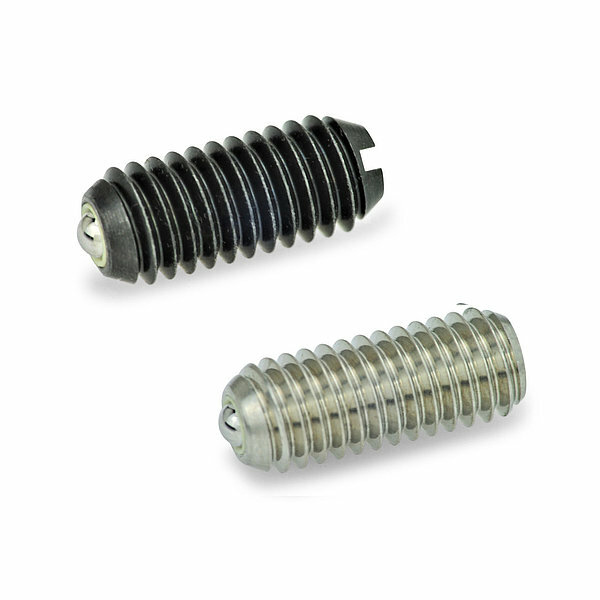 New Ball Plungers for securing as well as for pressure and stand-off functions. JW Winco, Inc., A Ganter Company, a leading supplier of standard industrial machine components, now has available GN 615.5 Ball Plungers in A4 Stainless Steel, with Ceramic Ball, GN 615.8 Ball Plungers in Stainless Steel or Steel, with Friction Bearing, with Slot, and GN 615.9 Ball Plungers in Stainless Steel or Steel, with Friction Bearing, with Internal Hexagon. Versions 615.8 and 615.9 feature the ball mounted in a plastic friction bearing shell so as to be freely movable, which enables rolling and optimizes the securing characteristics. “Above all, this reduces wear on the mating part” Winkler said. “Another characteristic of these plungers is that the plastic friction bearing shell also acts as an electrical insulator.” Plastic shell temperature resistant up to 194 °F (90 °C). Click below for press releases on new products or additions and extensions to our product range! Click below to hear about our new products or new additions to our product range!